I was reaching going into my fall marathon, Kansas City. I hadn’t raced a marathon in a year, after recovering from an injury in August 2015. My training had gone well, and tune-up races and workouts pointed to a good performance. I was targeting 3:10 – a minute faster than I ran last year. However, I failed spectacularly. 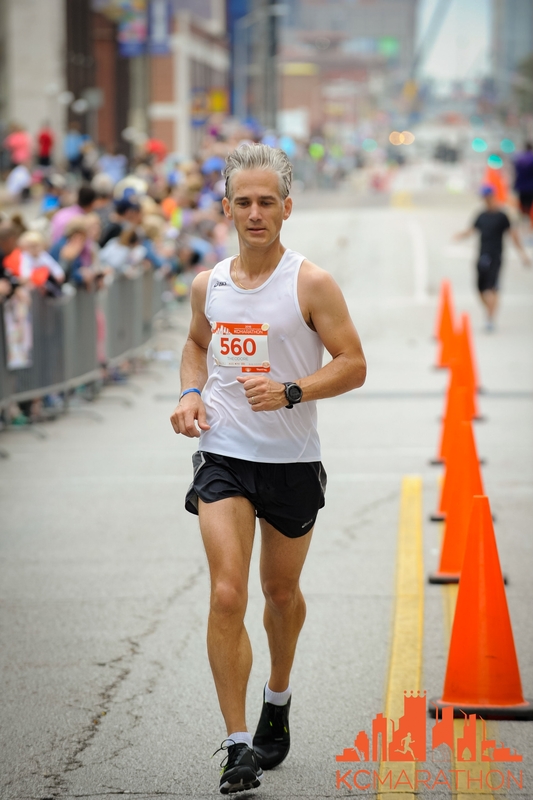 A 3:31 – my slowest timed marathon ever. What happened? The analysis is simple. I was unwilling to be mediocre, and weather conditions didn’t permit me to be excellent. The result: a crash and burn beginning in mile 18. Ideally, I’d like it to be about 45F at the start of a race. However, it was 65F at 7am, with high humidity and 30 mph winds from the south. Not good. There’s a physiological penalty for anything over 60F, as your body expends extra energy trying to cool itself. And of course a headwind never helped anyone run faster. Did I know these things at the start line? Of course I did! I probably could have eased off the gas and run a 3:15-3:20 without incident, but I didn’t know what the day had in store at that point. A side stitch struck in mile 18. We’ve all experienced them before when running, and we have a vague idea that they happen when you’re pushing too hard. They’re caused by a spasm of your diaphragm, which is a sheet of muscle at the bottom of your rib cage that’s part of what allows you to breathe in the first place. Push the pace too hard, and hello side stitch! There’s no question I was pushing too hard with an ambitious pace. However, in the past I’ve always been able to ease off enough to keep going. When the pain set in around mile 18, I slowed my pace and started massaging it by digging my hand into it. I have no idea whether this is actually therapeutic or not, but it did make me feel as though I was doing something. Unfortunately, the pain got worse and worse – so bad I was hobbling, and practically doubled over. It was disappointing, but I soon came to realize I was going to have to walk until it went away. I walked the better part of two miles – some of them with a new friend – Matt, who’d hit the wall in his first marathon. We got each other shuffling again and resolved to finish. I had to drop back to a walk again after getting nauseous and sent him on. The nausea passed quickly, and I started running again and ran to the finish. I did not want to walk 6 miles, or DNF, so I’m glad I got underway. I wish I’d had this knowledge during the race, but my post-race research revealed a breathing technique that could have helped resolve the side stitch. Budd Coates, Runner’s World running coach, suggests: slow your pace; and exhale as the foot on the opposite side of the stitch strikes the ground. Not every step (you would probably hyperventilate). This releases the tension on the side of the diaphragm in spasm. I hope I never have to try this, but now I know what to do! So, how did I get to mile 18? Pretty fast. Too fast. I programmed a workout into my Garmin fenix 3 using the Smart Pacing 3:10 band they passed out at the expo. The bands are customized with mile splits that take into account the elevation changes of the course and the need to warm up intelligently and not go out too fast. You run a negative split. I programmed the mile splits into my Garmin with pace warnings set with the target pace as the upper boundary (too slow) and 30s faster as the lower boundary (too fast). Ideally, I think you’d like to be within about 10 seconds, not 30. However, I hadn’t tried this before and I didn’t want the watch alarming at me constantly. My first mile was just a touch over 30s too fast, the second was around 25s too fast. After that I settled into a pretty good range, mostly single digits faster than target pace. However, the cumulative effect of that was that I was over 2 minutes faster than target pace at the 12 mile mark. Everything before mile 10 was faster than the target split, mile 10 was dead on, and everything after was slower. Prior to mile 18 though, not much slower. At mile 17, I was still over a minute ahead of target pace, and at mile 18, just under a minute ahead. Of course from there, it just fell apart. You can’t walk two miles and get anywhere near your goal. In retrospect though, I doubt that a more faithful observance of the target paces would have saved me – I was simply running too fast for conditions – mine and the weather. Around the 24 mile mark, the 3:30 pace group caught me. I’d already long since been passed by the 3:15 group and one other pace group while walking. 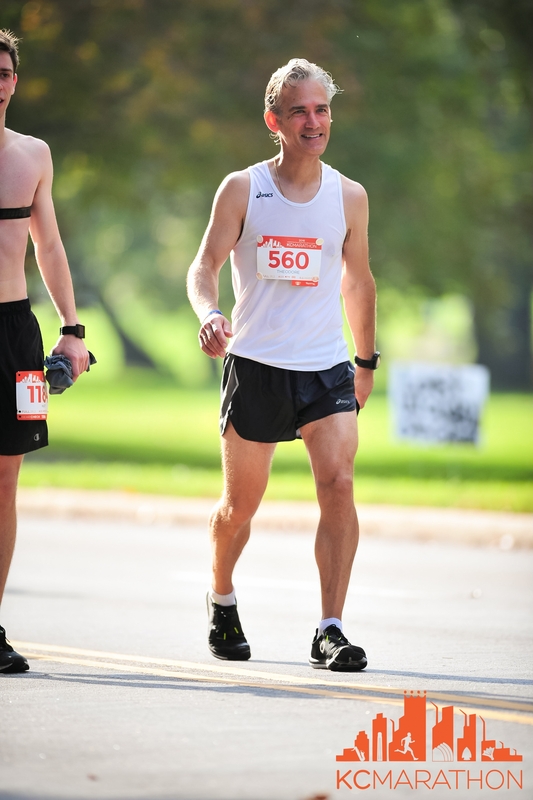 At this point, I was running, and I decided I felt good enough to run to the finish with them – I managed about 2.5 miles at just over 8:00 pace. The pacer was a bit off (not his fault – I think the course was a bit long due to some signage/traffic control problems on the Paseo in the new section) and I might have run harder to the finish to get it under 3:30, but when the clock came into view, that wasn’t an option. I felt pretty barfy afterwards. No elation at a goal achieved or age group victory (although as it turns out I wasn’t that far off). After about 2 hours of feeling sorry for myself, I decided to celebrate my failure. I also decided I was eager to run again! I toed the line thinking go big or go home, so when that’s your mentality you have to accept that failure is a risk! On the side stitch, I wonder if my breathing technique, of inhaling on three steps and exhaling on two, helps prevent side stitches by evening out the stress on the diaphragm. Maybe it does… but I still got one in Wichita. It might. I always seem to get mine on the same side. I don’t practice any rhythmic breathing like 3:2, but I suspect we all have some natural bias to striking on a particular side when exhaling. I’m also resolved to recommit to core strength during this next training cycle! I’ve been slacking the last month or two. I fear the day I enter a long distance race that is hotter and more windy than will allow a PR. Do I still go for it or do I run more conservatively? You went for it!!! What are we running from? Mediocrity! I heard a new one (new to me anyway) from a friend this weekend – “PR or ER!” I smell mantra.